One of the most difficult things in winter is deciding if it is safe to go out on a frozen lake or pond. We have studied various state and insurance websites for information. You can do the same or you can review the information below. If you don't have any experience on lake ice then you will find the information below new. If you have experience then a review is always a good thing. Also, checkout some of the videos below. Ice Thickness, what is safe. How do I determine the thickness of ice and what equipment do I need? What should you do if you fall through the ice? Self Rescue - Make a set of ice rescue claws. What if your vehicle breaks through? ​​What if someone else falls in? First of all, no ice is 100% safe! Just like all sports and outdoor activities there is a inherent danger. Heck, if you cross the street you could die but we all do it every day. What we are saying is use some common sense with respect to safety. 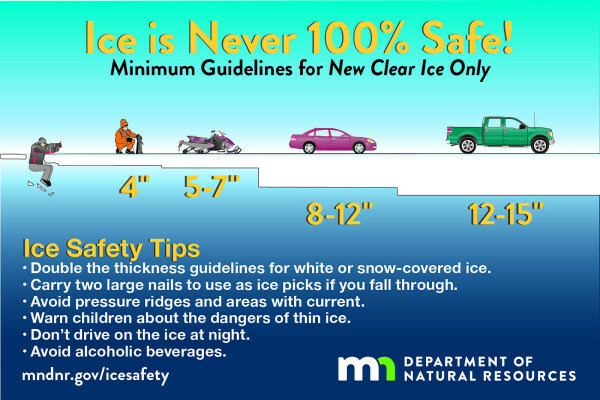 Remember, many factors other than thickness can cause ice to be unsafe. Checking ice thickness every 150 feet! State authorities DO NOT test ice thicknes on lakes. Your safety is your responsibility. 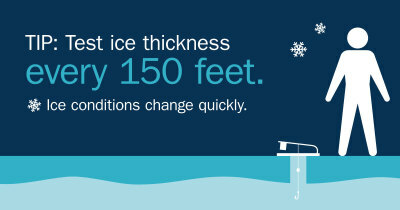 Check ice thickness at least every 150 feet. So now you got the rule of thumb for ice thickness. You are now standing on the shore of your local lake. How do I determine the thickness of ice and what equipment do I need? The following should give you methods. Ice Chisel - An ice chisel is a metal rod with a sharp, flat blade welded onto one end. Drive the chisel into the ice, using a stabbing motion, to create a hole. Ice Auger - (If you are ice fishing then you probably have one of these.) There are 3 different kinds of augers: hand, electric and gas. Hand augers are low cost, light weight and quiet. Electric augers are also quiet, but use less manual labor than a hand auger. Gas augers drill through ice the fastest, but are heavier, noisier and generally more costly than hand or electric models. Cordless drill - (We like this one the best!) Using a cordless drill and a long, five-eighths inch wood auger bit, you can drill through eight inches of ice in less than 30 seconds. Most cordless drills that are at least 7.2 volts will work, but the type of bit is critical. You need a wood auger bit since they have a spiral called a "flute" around the shaft that metal drilling bits don't. The flutes pull the ice chips out of the hole and help keep it from getting stuck, much in the way a full-sized ice auger works. After drilling a hole, measure ice thickness with a measure tape. Dry the bit and give it a quick spray of silicone lubricant after each use to prevent rust. Second, now we have a hole, you need to measure how thick. Use a tape measure to find ice’s true thickness. Put the tape measure into the hole and hook the bottom edge of ice before taking measurement. You can also use an ice fisherman's ice skimmer with inch markings on the handle in place of the tape measure. Don't judge ice thickness by how easily a chisel or drill breaks the surface. It happens so quickly that it’s easy to overestimate the thickness. In a vehicle - Refrain from driving on ice whenever possible. If you must drive a vehicle, be prepared to leave it in a hurry--keep windows down and have a simple emergency plan of action you have discussed with your passengers. On Foot or Skates - Wear a life vest under your winter gear. Or wear one of the new flotation snowmobile suits. And it's a good idea to carry a pair of ice picks (see below) that may be home made or purchased from most well stocked sporting goods stores that cater to winter anglers. It's amazing how difficult it can be to pull yourself back onto the surface of unbroken but wet and slippery ice while wearing a snowmobile suit weighted down with 60 lbs of water. The ice picks really help pulling yourself back onto solid ice. CAUTION: Do NOT wear a flotation device when traveling across the ice in an enclosed vehicle! Snow Machines - Don't "overdrive" your snowmobile's headlight. At even 30 miles per hour, it can take a much longer distance to stop on ice than your headlight shines. Many fatal snowmobile through-the-ice accidents occur because the machine was traveling too fast for the operator to stop when the headlamp illuminated the hole in the ice. Even "just a couple of beers" are enough to cause a careless error in judgment that could cost you your life. And contrary to common belief, alcohol actually makes you colder rather than warming you up. According to Dr. William Haynes, director of Clinical Pharmacology at the University of Iowa, “Consumption of alcohol undoes many of the human body’s healthy reflexes, one of which is keeping the core body temperature warm in cold weather.” It doesn’t even take that much for this effect to kick in. Just one alcoholic drink will start the process that results in a lowered core body temperature. It causes your blood vessels to dilate, particularly the capillaries just under the surface of your skin. When you have a drink, the volume of blood brought to the skin’s surface increases, making you feel warm. (That dilation is why slightly or exceedingly intoxicated people look flushed.) This overrides one of your body’s defenses against cold temperatures: Constricting your blood vessels, thereby minimizing blood flow to your skin in order to keep your core body temperature up. Drinking alcohol in chilly weather also reduces the body’s ability and tendency to shiver, taking away yet another method your body uses to help keep warm when it is cold. First, try not to panic. This may be easier said than done, unless you have worked out a survival plan in advance. Read through these steps so that you can be prepared. Don't remove your winter clothing. Heavy clothes won't drag you down, but instead can trap air to provide warmth and flotation. This is especially true with a snowmobile suit. Be Prepared so you can Save yourself! Make a set of ice rescue claws. Get two 4" pieces of wooden doweling the size of a broom handle or a little larger. Whatever material you select, it should float in case you drop the claws while struggling. Drive a stout nail into one end of each dowel. This should be a hardened 16 penny or larger concrete nail. Use a file to sharpen the nail heads to a point. Drill a hole into the dowels (in the end opposite the nail) and tie a length of strong cord through the hole so a pick is on each end "jump-rope" fashion. You may also drill a hole in the ends alongside the nails so the nail on the other pick can nest in the hole, keeping both points covered. Keep the picks in your pocket for quick emergency access if you or a companion do break through. If your car or truck plunges through the ice, the best time to escape is before it sinks, not after. It will stay afloat a few seconds to several minutes depending on the airtightness of the vehicle. While the car is still afloat, the best escape hatches are the side windows since the doors may be held shut by the water pressure. If the windows are blocked, use an emergency safety tool, like a spring loaded emergency hammer or an object from inside the vehicle to break the glass. Firefighters carry these and you can buy one online to keep in your glove box. A vehicle with its engine in the front will sink at a steep angle and may land on its roof if the water is 15 feet or deeper. As the car starts its final plunge to the bottom, water rapidly displaces the remaining air. An air bubble can stay in a submerged vehicle, but it is unlikely that it would remain by the time the car hits the bottom. When the car is completely filled, the doors may be a little easier to open unless they are blocked by mud and silt. Remember too, chances are that the car will be upside-down at this point! Add darkness and near freezing water, and your chances of escape have greatly diminished. This underscores the necessity of getting out of the car before it starts to sink! What if someone else falls through and you are the only one around to help? First, call 911 for help. There is a good chance someone near you may be carrying a cell phone. Resist the urge to run up to the edge of the hole. This would most likely result in two victims in the water. Also, do not risk your life to attempt to save a pet or other animal. PREACH - Shout to the victim to encourage them to fight to survive and reassure them that help is on the way. REACH - If you can safely reach the victim from shore, extend an object such as a rope, ladder, or jumper cables to the victim. If the person starts to pull you in, release your grip on the object and start over. THROW - Toss one end of a rope or something that will float to the victim. Have them tie the rope around themselves before they are too weakened by the cold to grasp it. ROW - Find a light boat to push across the ice ahead of you. Push it to the edge of the hole, get into the boat and pull the victim in over the bow. It’s not a bad idea to attach some rope to the boat, so others can help pull you and the victim to safety. GO - A non-professional shouldn’t go out on the ice to perform a rescue unless all other basic rescue techniques have been ruled out.